Coe Press Equipment, Sterling Heights, MI, will feature its new ServoMaster Touch controller, which includes a user-friendly 5.7-in. VGA color touchscreen interface with customizable operator screens. 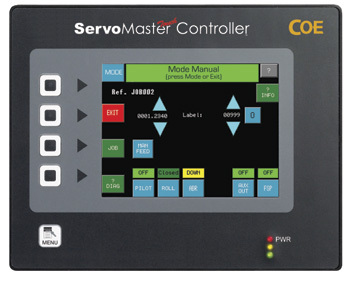 New features of the controller include streamlined entry of machine setup information and enhancements to the operator prompts, machine diagnostics and serial communications to the press controls. Additional capabilities include production data reporting of feed cycles and material usage, and downloading of setup data or job number selection. Its multiaxis capabilities include push-pull, zig-zag and tailout configurations. Auxiliary functions achievable through its servo-feed automation feature include motorized and encoded passline height, motorized and encoded automatic edge guides, feed-roll pressure control and material support table position.